MC-27J is a new multimission transport aircraft jointly produced and marketed by Alenia Aermacchi and ATK. It is a roll on/roll off (RO/RO) aircraft based on the C-27J Spartan. The MC-27J is an affordable alternative to the current special-mission aircraft. Alenia unveiled a new version of the C-27J Spartan battlefield air-lifter, the MC-27J, at the Farnborough International Air Show in July 2012. The MC-27J is a multirole, armed, RO/RO variant of the C-27J. The MC-27J is designed to support air forces and Special Forces involved in the tactical transport, intelligence, surveillance and reconnaissance (ISR) missions, anti-terrorism operations, the evacuation of military and civilians from crisis zones and the fight against asymmetric threats. "MC-27J is based on the combat proven airframe of the C-27J." MC-27J is based on the combat proven airframe of the C-27J. The base platform is slightly modified, while the airlift capabilities of C-27J are retained. The new aircraft is incorporated with pallet-based systems for additional mission-specific capabilities. The aircraft has a length of 22.7m, wing span of 28.7m and a height of 9.6m. The maximum take-off weight of the MC-27J is 30,500kg. The modern, two-pilot glass cockpit of the MC-27J is equipped with a state-of-the-art, off-the-shelf avionics suite. The cockpit is fully compatible with night vision imaging systems. The avionics suite integrates colour multipurpose displays, multifunction control and display units, optional head-up display units, digital auto-pilot, GPS/INS, identification friend or foe (IFF) transponder, recording systems, terrain awareness warning system (TAWS) and traffic alert and collision avoidance system (TCAS). 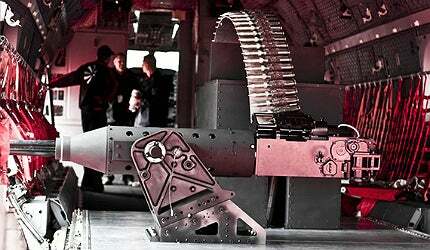 The GAU-23 Bushmaster 30mm cannon mounted on the PaWS RO/RO pallet is a next-generation chain gun. The gun incorporates battle proven features of the M242 and Mk44 25mm cannons. The gun can fire 30mm x 173mm, PGU-13, PGU-15, and PGU-46 ammunition at a rate of 200 rounds a minute. The ammunition is fed into the gun through a dual feed system. The palletised system also accommodates a reconfigurable mission suite incorporating sensors, communications and mission management system. The aircraft is equipped with electro-optical / infrared targeting sensors, modern command, control and communications equipment. "The GAU-23 Bushmaster 30mm cannon mounted on the PaWS RO/RO pallet is a next-generation chain gun." The MC-27J can fly at a maximum altitude of 30,000ft. It has a cruising speed of 583km/h and a maximum speed of 602km/h. The maximum range and ferry range of the aircraft are 1,852km and 5,926km respectively.